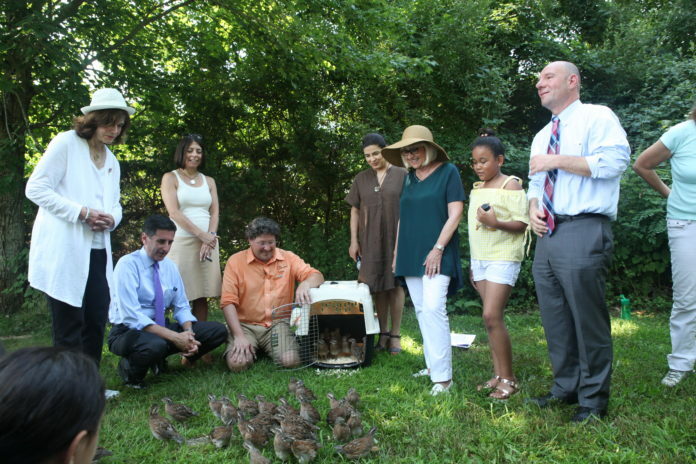 Having grown them from when they were eggs, North Hempstead held a ceremony Tuesday to release Northern bobwhite quails into the wild as part of a pest control program. The quails, though, were released into the woods not to the strains of “Pomp and Circumstance” but to “Circle of Life” from the Disney movie “The Lion King.” Several members of the North Hempstead council and children from Yes We Can Community Center were in attendance at North Hempstead Beach Park in Port Washington to see the quails off. The quails — named “bobwhite” for their distinctive call — are being reintroduced to the park to consume ticks, the tiny insects that cling to deer, dogs and other animals and can spread Lyme disease. Biologist Eric Powers worked with North Hempstead to help reintroduce the species to the area, which was once part of its native habitat. He said that the absence of quails has led to an increase in ticks, which led to local municipalities using pesticides. Powers said that manmade problems led to the loss of quail populations in North Hempstead. The millions of people who moved to Long Island altered the quails’ habitat to build roads and homes. People also brought thousands of cats with them. The abundance of cats has greatly harmed the quail population, Powers said, since the bird lives on the ground and struggles to fly. This was the second year that the town has released quails into the wild. More than 70 birds were released in North Hempstead Beach Park and in the woods of Port Washington this year, joining the 25 or so released in August 2017. The quails were raised at the town’s TV studio at the Yes We Can Community Center, where their hatching could be viewed on a video stream. After hatching in May, the birds were sent to Caleb Smith State Park in Suffolk County to mature. Bosworth said the egg incubator purchased last year cost $200 and spent $126.60 on eggs. She said it was much cheaper than constantly spraying insecticide on the wooded areas of North Hempstead. How much of an effect the quail has on the tick population has yet to be determined. Powers and other town employees are conducting a study on the tick population, which is done by dragging a white sheet over vegetation along the trail. As for the quail, Powers said he is not sure what happens to them, as none them have been tagged with tracking devices. With the bird’s camouflage and habit of staying still in the presence of danger, he said they are almost impossible to find in the wild. “If we can secure some larger funding … I would love to be able to track them and see where they’re going, how they’re surviving,” he said. Both Bosworth and Powers expressed support for releasing more quails next summer.